The trailer for the movie, as well as what I wrote, are below. During the film, I had to pee. There was no way I was going to make it through the entire movie; that big cup of chai from Peet’s was working its way through me. About thirty-five minutes in, I had to get up and go. Before Julianne Moore peed herself, I had to pee; I had to get up and leave Alice behind. We were already sliding deep into her dementia—Alice—this character from a book, adapted into a script for this very actress. Alice, a fifty-year-old professor, a mother of three; I saw myself in her and her children: early onset dementia. I knew what the film was about. I wasn’t innocent or naïve, not anymore, not for a long time. I didn’t want to go, didn’t want to leave Alice, but in the bathroom mirror, while hastily washing my hands, I had to remind myself: It’s only a movie. It’s only a movie. Like I had just left a horror film, or worse, had just awakened from a nightmare, and was about to fall back down into it again. There were parallels: the teacher who just turned fifty, the genetic marker that I may or may not have, that my siblings may or may not have. There was Alice’s youngest child who knows something is wrong with her mother. There were parallels. But I didn’t get pulled back into the fear and sorrow the way I would have—the way I often did—ten or fifteen years ago. No. Now I was mourning for Alice and everything she was losing. Her words. A linguist without words. And I was mourning for her husband, too terrified to admit what he was most afraid of. I mourned for Alice and her family. After the movie, I had to take myself out, I had to take myself out to a loud bar and drink vodka, and sit on the sidelines watching the other gay men dance. The familiar disco ball and the video screens full of performers half my age. I numbed myself to stay in one place: here. Numbed myself to that old sorrow that I have greeted over and over again. All that we lost when Mama got sick: the lunch dates and the phone calls, the sense of being seen and loved and known for a lifetime—hers and mine—cut off at that terrible place by that terrible disease. I sometimes welcome that old sorrow, my old friend, the part of me that survived her, survived it. I navigated my way back to pop songs and bright pink Cosmopolitans, to handsome men named Michael, who ask you to dance, to come in from the sidelines, and hug you goodbye, because we all have to get up in the morning, don’t we? We have to get up in the morning and begin this remembering and forgetting all over again. The prompt this time was the song “Over the Rainbow.” There are many renditions of this song, but the one I chose is from the TV show Glee (click here to hear the beautiful harmony of Matthew Morrison and Mark Salling singing Israel “IZ” Kamakawiwo’ole’s version of this famous song). See the video prompt (Judy Garland in The Wizard of Oz), and what I wrote, below. He reaches a precipice: 49. One year away from dead in gay male years. And he peers over into this strange nothingness. “What now?” he asks, and no answer comes. In the morning, after yoga, he hooks the strap around his hips and ankles, lies flat, opens his heart to the shiny ceiling, and waits for an answer. This was supposed to be the time in his life that included anniversaries and graduations. The family raised up, the husband and he renewing their vows, maybe a new vacation rental in Sonoma. Instead, he battles weeds in a dusty backyard that he shares with six other people, draws from his savings account to pay his rent, and arrives home after a fourteen-hour plane ride and a $50 cab ride to an empty apartment that smells like dust and enamel paint. In Europe, he visited a castle and realized the gay king who lived there was just as lost in the fantasy of romantic love (and all it should look like) as he has always been. Vaulted ceilings and spire-topped towers, lovely long balconies and mythical paintings. Poor King Ludwig was just as misinformed about real life and the loss of dreams as any contemporary gay man. He and Ludwig both thought someday my prince will come, knight in shining armor, the pot of gold at the end of the rainbow. Indeed. We’re all shitting rainbows. We are. Keychains, necklaces, even crosswalks. Rainbows everywhere. Everywhere but that one in the sky. Ever elusive. Intangible. Unreal. Caterpillars take their time, so why can’t I? I found myself struggling to write, so I decided to write directly to my participants. You can find that piece below. Well, listen. I really want to write something profound. I want to move you the way you’ve moved me; I want to tell you made up stories about brave gay boys and wise women, but I am not Armisted Maupin and this is not a Tales of the City moment. I want to tell you about kind mothers who knew about loving their little boys without judgment, mothers who taught their boys to bake, and sing, who clapped with them when those boys danced on their toes. Someday my prince will come. I want to sing to you now, something Broadway big and vaguely familiar, to build up to the perfect final lines: The cold never bothered me anyway. I want to do this, all of this, for you, for all of you, brave, bright, beautiful, bold, brilliant you, to remind you that you still have stories to tell and that there are people who want to hear them. To remind you that if you are afraid, this will pass. That there are safe places to write, to sit, to think, that there are people who are going to welcome you and protect you and love and respect you. I want to tell you all of this with beautiful modifiers, clever alliteration, and gorgeous metaphors, but all I have is ten minutes, and this pen that’s running out of ink, and this little body racing against time, and my little heart, beating, beating, beating, holding your words here, right here, now. Click here to hear the song (and then write in response for 20 minutes). Don’t write about loss. Write about lemons: Meyer, Eureka, Lisbon, a whole bag delivered to your door. Write about blossoming trees: plum and cherry, pink clouds lining the city streets. Don’t keep winding back to that twenty-something who felt trapped: queer, stuck in the suburbs, his mother a ghost in polyester pants, a diaper underneath. Don’t write about the long, confusing, on-and-off with the handsome man with the black coffee eyes and the beautiful feet, the one who wouldn’t save himself, the one you couldn’t save. Write about adding cream to caramelized sugar, and butterscotch pot de creme. 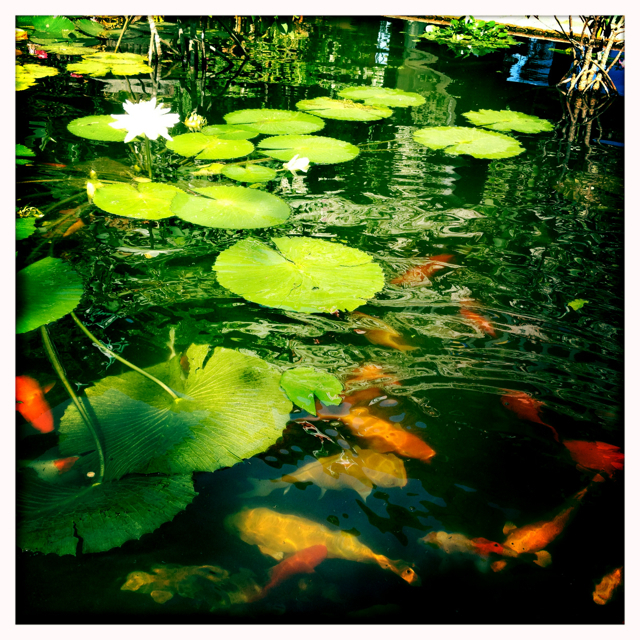 Write about the tri-colored koi at the Botanical Gardens just thirty minutes from Puerto Vallarta, the bumpy bus ride past Boca and Mismaloya, the way the locals are lulled to sleep by the rush of warm air from the open windows, the wide curves, the growl of the engine. Don’t write about sleepless nights, or age spots, the aisle in Costco where you seriously considered the bottle of promises for $124. No one wants to hear that you’re lonely some nights, so lonely that you go out and talk to strangers, drink too much, make out in crowded bars with men you don’t even know. Don’t weave your way in and out of self-analysis: the way you still yearn sometimes to live out her shortened life for her, to be a parent, to grow old, be a grandparent. Don’t talk about Daddy issues, or how you delete the profiles of men who sound too much like Papa, even though you still hold a tiny grain of hope that he’s out there, that he’s waiting to be a rock, to do what’s best for you. Focus on the flowers: narcissus rising like angels from a glass vase, calla lillies taking root in the shadowy corners of the yard, and the promise of lilacs this year. Little buds in the branches. The promise of those. The promise. A few prompts for you this time, plus a video that will inspire mindfulness. What is it about sadness that can be so fulfilling? My advice? Save the prompts for later, and watch the film now (it’s nine minutes, but worth every second). While you’re floating in the space that the film leaves you in, take pen to paper, and see what comes out.